Altynai, 24, doesn’t know what she will do if her parents stop sending money from Russia. She’ll be in a hopeless situation without those 20,000 soms (£220) a month — this money is her only way of surviving. For the past three years, Altynai (name changed) has been living with her grandmother, whose pension isn’t enough to buy anything. She says that residents of her village in the Batken region of Kyrgyzstan frequently leave to work abroad. There’s never enough jobs here in Leylek district, which is bordered by Tajikistan on three sides. There are no new enterprises being opened. Most people work for low wages in state institutions. Indeed, over the past decade, more and more people have been leaving Kyrgyzstan to work abroad. In Russia alone, there are more than 800,000 Kyrgyz citizens on the migration register. Most of them come to work. In 2017, they made money transfers to Kyrgyzstan totalling $2.5 billion — which was more than the total state annual expenditure. This is the second year in a row that Kyrgyzstan ranks first in the world in terms of percentage of remittances to GDP, overtaking Tajikistan and Tonga. Batken region, where Altynai and her grandmother live, is the poorest in the country. Here, forty percent of the population live below the poverty line, with no more than 2,600 soms (£28) per month. Without payments from abroad, the percentage of people living below the poverty line would reach a staggering 60%. Using data provided by the National Statistics Commission, Kloop rated the most vulnerable regions in Kyrgyzstan — the poorer a region is, the more it becomes dependent on remittances from abroad. This concerns, first and foremost, the Batken, Jalalabad and Osh regions. In 2015, the National Bank examined data from a survey of 2,800 families in Kyrgyzstan and concluded that three quarters of remittance recipients spend this money on consumer goods — food, clothes, household items. This money more often goes on weddings than education or health care. Remittances are often used to save families in Kyrgyzstan from hunger. Illustration: Daria Udalova. Analysts with the National Bank believe that spending labour remittances on consumer goods “isn’t a bad thing”. For them, buying consumer goods stimulates the economy, helping local producers sell more goods. Of course, money from abroad is used to buy not only Kyrgyz-made goods, but also imported ones. 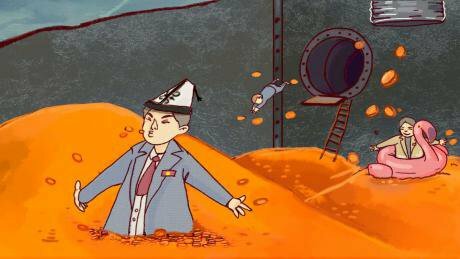 For Kyrgyzstan to experience significant economic growth, it needs investments. Labour remittances could be used to invest in business, banking or securities. But according to a study by the National Bank, only 0.3% of the population do this. Meder, from Batken region, is one of these enterprising people. For five years now, Meder, together with his partners, has been selling construction materials in the town of Isfana. He makes more money now than he did in Russia, where he worked for three years as a builder and loader — often for days at a time, and without holidays. “I went to Moscow because I was in a dead-end situation, there was no work here [...] I had [a loan] at that moment. My mother was seriously ill, and my brother is an invalid. I had to go,” Meder recalls. While he was Russia, Meder dreamed of setting up his own business (“so I wouldn’t have to be a migrant worker”), which is why his parents began saving the money he sent them. It was thanks to these savings that Meder managed to set up his own business. The National Bank believes that commercial banks could attract migrants into the financial sector by creating deposit accounts with special conditions, conducting consultations on financial literacy or giving business loans to returning migrants. But the banks themselves are not particularly interested in this, preferring to earn money on loans to large businesses, commissions on money transfers and serving clients. The National Bank sees its role as “guaranteeing macroeconomic stability” and “supporting stable prices”. Together with the government, the Bank tries to teach Kyrgyz citizens how to use their money more effectively. Remittances help reduce poverty levels — and the state avoid its responsibilities. Illustration: Daria Udalova. No country in the world is as dependent on labour remittances as Kyrgyzstan. If 10 years ago, remittances made up 20% of the country’s GDP, then today they’re nearly 40%. 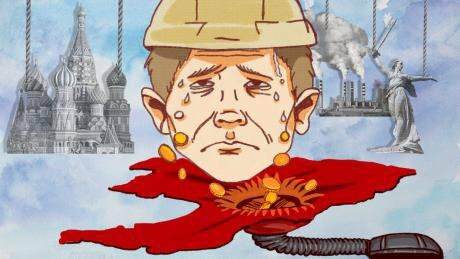 This dependence is dangerous for Kyrgyzstan’s economy, as shown by the Russian crisis of 2014-2015, when payments dropped and the number of people living in poverty rose by 1.5%. 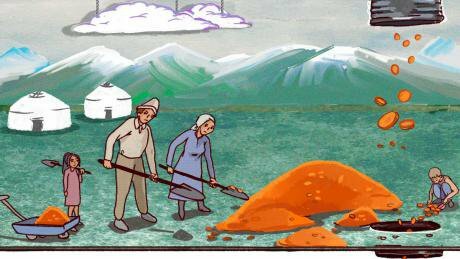 “The future doesn’t good for Batken,” says Nasritdinov. “Another crisis in Russia will make the situation even worse. [...] It’s very unstable and unreliable, a crisis can hit at any moment.” He thinks that the latest US sanctions against Russia and tougher laws on registration for migrants in Russia could have an impact on money transfers. The Kyrgyz authorities are planning to solve this problem in their own way — in the draft National Strategy on Stable Development for 2040, they’re planning on expanding the number of locations that people travel to for work. This is why the state plans to help people leave to work abroad and raise their ability to compete abroad. It seems that Kyrgyzstan will continue to survive on the hard-earned money of migrants for a long time to come. This article was prepared as part of the Data Fellowship programme of Internews Media-K Project, which is funded by USAID in Kyrgyzstan and supported by the World Bank, IDEM Institute and the School of Data - Kyrgyzstan.